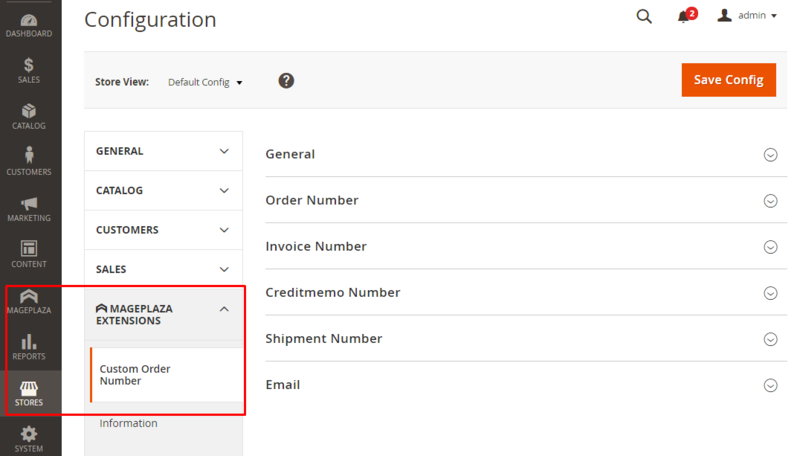 With the ID of Order, Invoice, Shipment or Credit Memo, the default ID of Magento only includes the numbers and the ID of the first order is 000000001. Therefore, with newly established websites, the order quantity is low, which makes customers feel that this store has no the high reliability. This leads to the low number of purchasing quantity of customers at your store. Besides that, to manage the orders of customer that are created on whichever date, month, year of the store, store owners have to view the detail of the orders, this will cause the inconvenience for them. 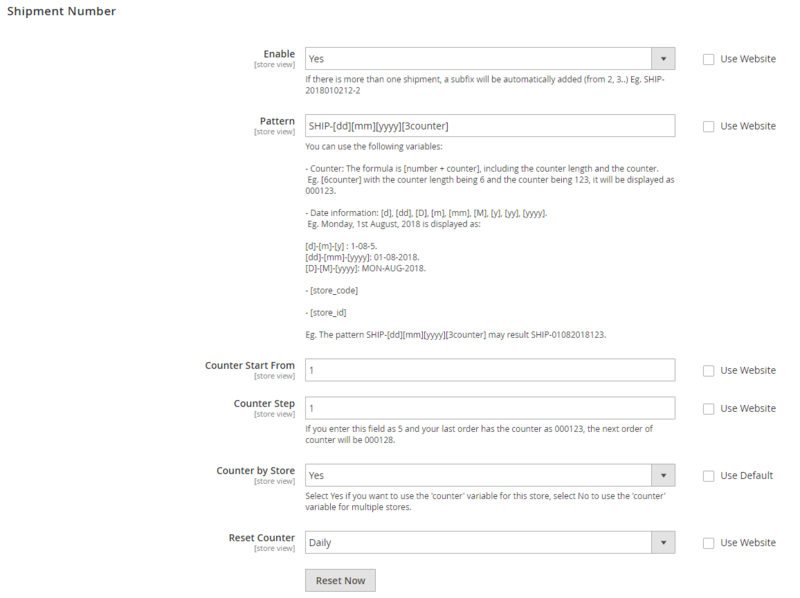 To resolve this problem, Mageplaza has launched a handy extension, called Magento 2 Custom Order Number. - This extension is applied to multiple stores. - Stores are set the default as the Default Configuration. - To change the configuration for each store, need to remove tick at Use Website on the right of each option. - Config of the extension in each store will be applied in the store itself. - Config in this store doesn't affect the config in the other store. If leaving this field blank, after you save, the Invoice ID will display the same as the configuration of Magento. The ID of the next invoice will begin with the number entered and it will incrementally increase based on the Counter by Step field below. If you want to change the Counter Start From field, after entering a new value and saving, admins need to click on Reset Now button so that the Invoice ID can get a new Counter Start From value. If leaving this field blank, the default ID of invoices will be separated by 1 unit. If you choose Yes, the invoice ID of the different stores will be increased separately based on the configuration of each store. For example, store A has an invoice ID as 50, store B has no invoice. Customers purchase the product at the store B, this invoice ID is 01. If you choose No, the invoice ID of different stores will be merged and increased in succession based on the configuration of Main Website. For instance: Store A has 50 invoices and the invoice ID is 50, store B don’t have any invoice. 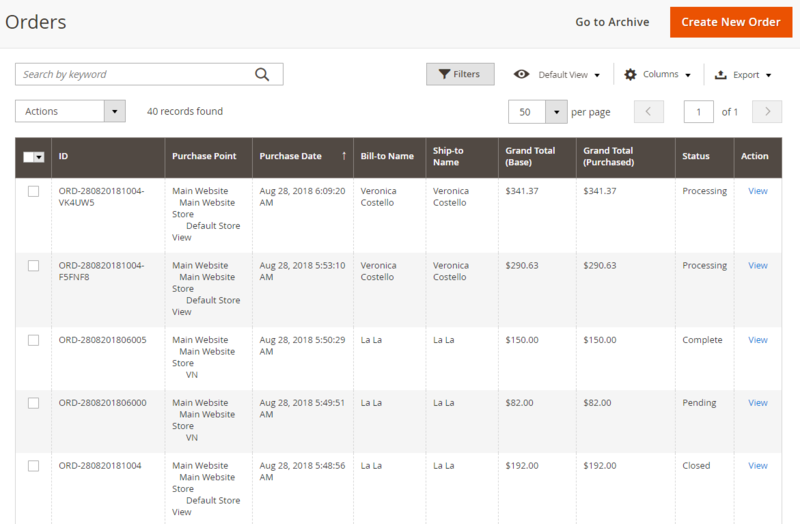 When customers purchase the products in the store B, the invoice ID of store B is 51. Reset Now Button: Counter will be reset to the Counter Start From value that is using instantly. For example, Counter Start From field is 10000 now, Counter Step is 5. 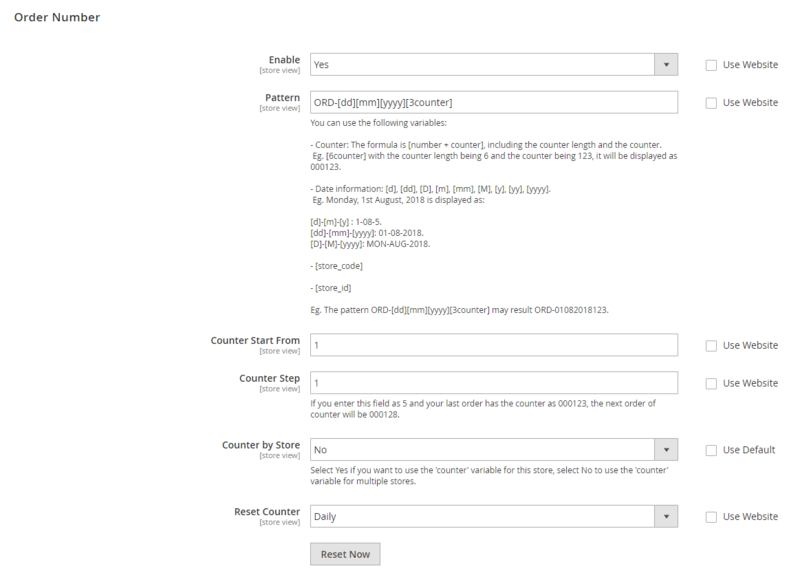 After a long time to order and click on Reset Now, the ID of the next invoice after resetting will start from Counter Start From + Counter Step values. Choose Yes to use the function that allows configuring the change of the Shipment ID. If leaving this field blank, after you save, the Shipment ID will display the same as the configuration of Magento. The ID of the next shipment will begin with the number entered and it will incrementally increase based on the Counter by Step field below. If you want to change the Counter Start From field, after entering a new value and saving, admins need to click on Reset Now button so that the Shipment ID can get a new Counter Start From value. If leaving this field blank, the default ID of shipments will be separated by 1 unit. If you choose Yes, the shipment ID of the different stores will be increased separately based on the configuration of each store. For example, store A has an shipment ID as 50, store B has no shipment. Customers purchase the product at the store B, this shipment ID is 01. If you choose No, the shipment ID of different stores will be merged and increased in succession based on the configuration of Main Website. For instance: Store A has 50 shipments and the shipment ID is 50, store B don’t have any shipment. When customers purchase the products in the store B, the shipment ID of store B is 51. Reset Now Button: Counter will be reset to the Counter Start From value that is using instantly. For example, Counter Start From field is 10000 now, Counter Step is 5. 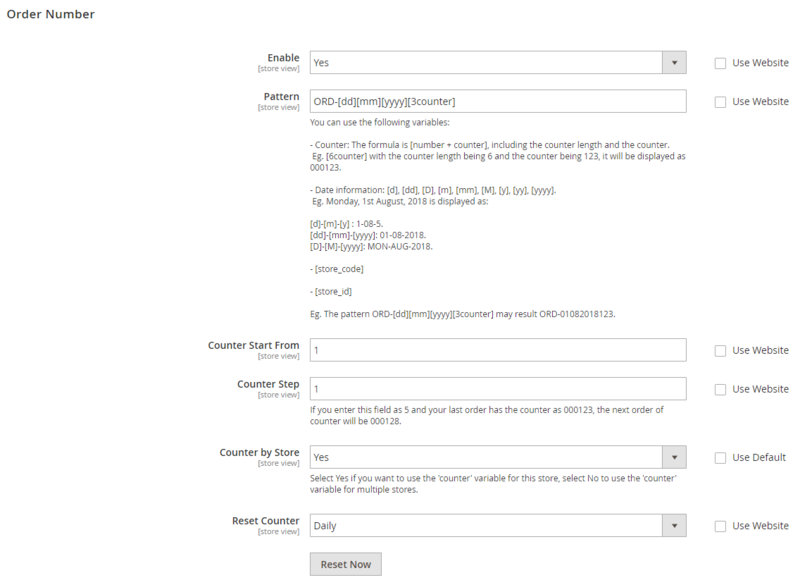 After a long time to order and click on Reset Now, the ID of the next shipment after resetting will start from Counter Start From + Counter Step values. Choose Yes to use the function that allows configuring the change of the Credit Memo ID. The ID of the next credit memo will begin with the number entered and it will incrementally increase based on the Counter by Step field below. If you want to change the Counter Start From field, after entering a new value and saving, admins need to click on Reset Now button so that the credit memo ID can get a new Counter Start From value. If leaving this field blank, the default ID of credit memos will be separated by 1 unit. If you choose Yes, the credit memo ID of the different stores will be increased separately based on the configuration of each store. For example, store A has an credit memo ID as 50, store B has no credit memo. Customers purchase the product at the store B, this credit memo ID is 01. If you choose No, the credit memo ID of different stores will be merged and increased in succession based on the configuration of Main Website. For instance: Store A has 50 credit memos and the credit memo ID is 50, store B don’t have any credit memo. When customers purchase the products in the store B, after this order is refunded, the credit memo ID is 51. Reset Now Button: Counter will be reset to the Counter Start From value that is using instantly. For example, Counter Start From field is 10000 now, Counter Step is 5. 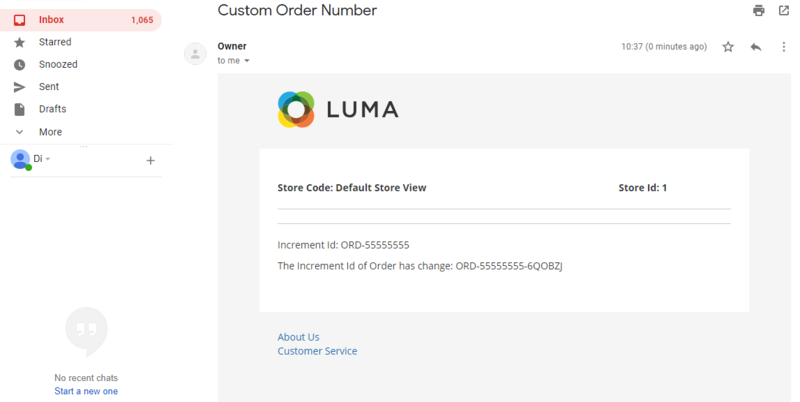 After a long time to order and click on Reset Now, the ID of the next credit memo after resetting will start from Counter Start From + Counter Step values. When the ID of the order, invoice, shipment or credit memos of the next time duplicates with the ID of the previous times, the ID will be automatically added to the variable [6AN] at the back and at that time, there’s an email to notify the store owner that the ID of the order, invoice, shipment or credit memos is existing and is replaced by the new ID. Send Email From: Choose the sender email notifications. If the ID of the order, invoice, shipment or credit memo deplicates with the existing IDs, the following IDs will be added a value [6AN] at the back of the pattern. 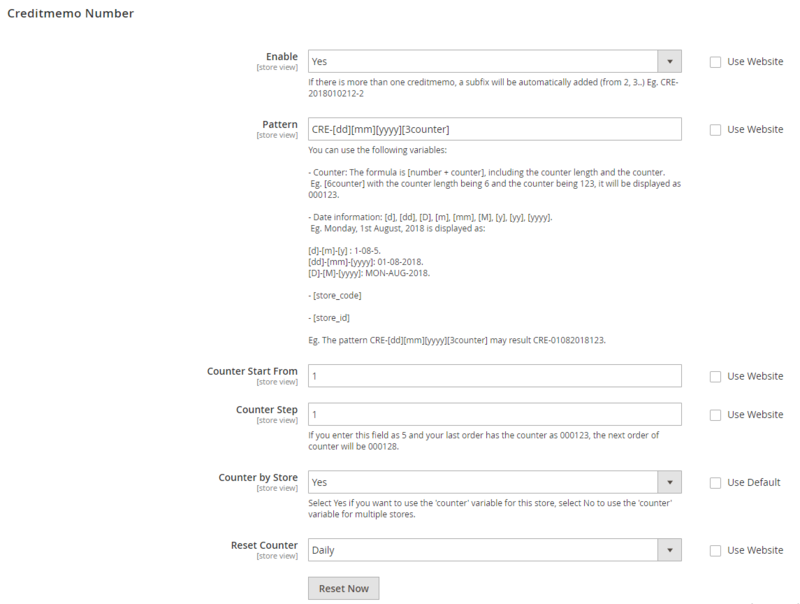 [6counter]: The format for the ID will be displayed with 6 counts depending on the configuration of the Counter fields. [d]: The format for the ID will be displayed as 1. This only applies for the date less than 10. With the cases, you choose the format as [dd], the date is less than 10, you need to apply the format of ID as 01, 02, 03, etc. Please click on here to know more information.